This is lab time -:). Normally you don’t do that on your production deployment. This is a guide on How to install VCSA 6.5 in VMware Workstation and see the different configuration options within the VMware vCenter Server Appliance (VCSA) 6.5. Yes, As you know, we have VMware vSphere 6.5 in GA state (General Availability), so it is available for download. It is the RTM code (No beta) so why not to test the installation in VMware Workstation? For production environments, you won’t do that. To deploy VCSA 6.5 in production you would have ESXi running on physical hardware. Not within VMware Workstation. We will be running VCSA 6.5 within VMware Workstation, which adds some overhead, but It is a test deployment. 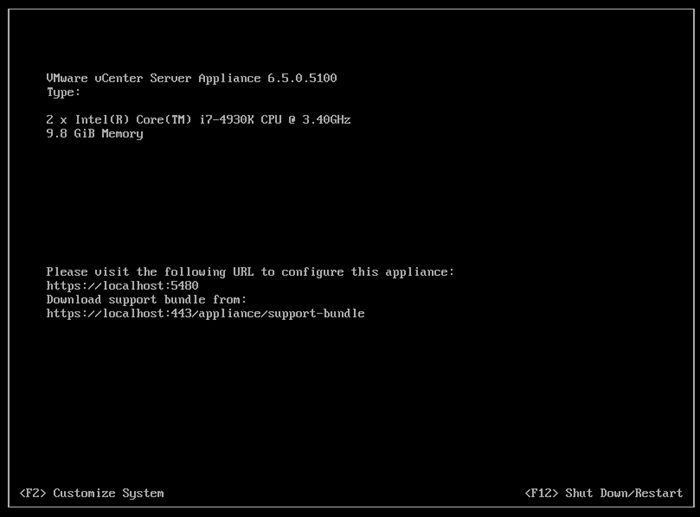 The appliance, VCSA 6.5, can run on Workstation (with some tweaks). But we can also fool the appliance and let it think that we have an ESXi running. We will deploy nested ESXi 6.5 and will be installing/deploying the VCSA 6.5 on the top of the ESXi!!! And the performance is pretty OK. -:). You’ll see it in the video. (Note that we’re doing it on a whitebox with hexacore CPU and 64 Gb of RAM). Update: The Latest Workstation v14 and Player v14 have a built-in feature which can seamlesly deploy VMware vCSA. No more VMX file tweaks. Check my post from the official release here. First Option – The first way is to import an OVF file into a VMware Workstation > Tweak the file with some additional options > then boot the VM. You may wonder why? To simulate production environment without having one… and because you don’t need to tweak VMX file of the VCSA. A thing you normally don’t do anyway. So we’ll show you both ways, but the second one will be more like what you would do in the production environment. (No tweaking of VMX files). I know that many folks don’t have too much money and runs a Whitebox with Windows/Linux OS and uses Desktop virtualization products like VMware Workstation to create a nested lab. It is a convenient way to learn more about virtualization. I’ve done that, I’ve been there. Even if now I have decent lab, which is evolutive (at least from the storage and RAM perspective). You’ll need to download the VMware vCenter Server Appliance (VCSA) 6.5 ISO from VMware and mount it. Then there is a folder there which has the OVA file – VMware-vCenter-Server-Appliance-6.5.0.5100-4602587_OVF10.ova and this file need to be imported into Workstation (by double-clicking). You’ll be asked to accept the CLUF. Update: You no longer need to use those tweaks (I don’t know it this still works, apparently some folks do have problems). Check Deploy VMware vCSA 6.5 in VMware Workstation 2017 (Tech Preview). You can uupgrade to the latest Workstation, or test with the trial if it works for your enviroment. Then before powering ON the VM just modify the VMX file with following lines (please adapt this to match your environment). (Note, that an example of this config has been adapted to fit my environment from enterprisedaddy.com blog here). During the process there will be prompts for a login, there will be the UI showing uninitialized, but you should not touch anything as many processes are working behind the scenes and both parts of the deployment phases are executing (deployment AND configuration). You’ll see it in the video as well !!! This is the final screen (image below) you should see when the deployment process finishes…. 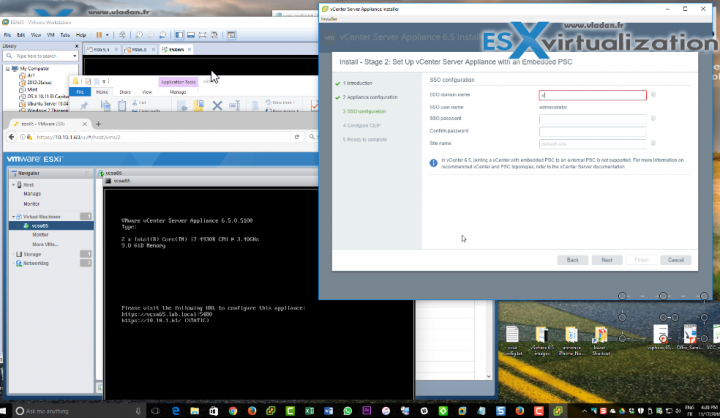 So, you should have your VCSA 6.5 deployed and running within VMware Workstation. Here we will do the following, and I’m sure that everyone pretty knows their way…. 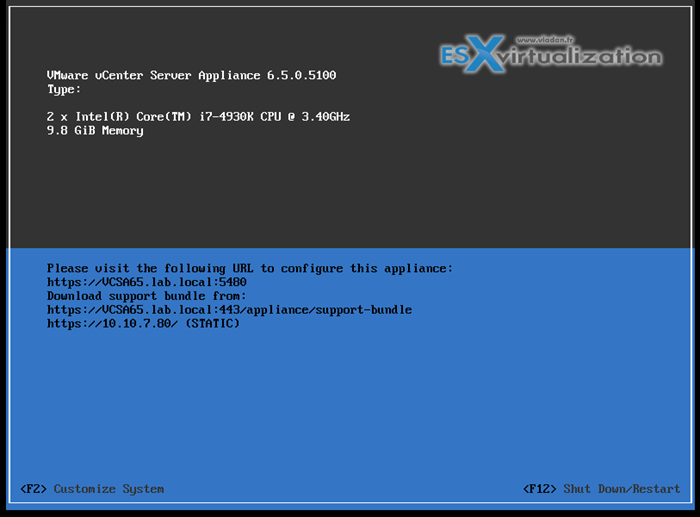 Installation and configuration of ESXi 6.5 within VMware Workstation (first part of the video – highly accelerated). I have done many posts on my blog explaining this. It’s no brainer now. Not necessary to tweak configs, no VMX tweaks necessary. Simply point this to the VCSA 6.5 ISO file and Workstation automatically recognizes which VM you want to create, and pick the right template. Check this – How To Install VMware VCSA 6 in VMware Workstation. Deployment and Configuration phase of VCSA – we point to the IP address of our nested ESXi and then start the deployment process…. You’ll see everything in the video. It’s quite self-explanatory. Yes, there are two phases (phase 1 is deployment and phase 2 is configuration). Here is the video from the process… Make sure to watch in a Full screen (it is 1080p video). I use ” Notepad++ ” to edit the WMX file and have no problems. i try to change the vmx file as your guide many times. however, after i start VM (i select NAT instead of Bridge – default one), the new configuration seem not to be changed. It still show me the default hostname photon-machine. I cannot reach the new IP (defined in vmx) as well. Could you please give me some helps? You have to delete the instance of the VM in your vCenter. (not the whole VM, just the pointer). Then only edit the VMX and re-register the VM in vCenter. First, thanks for your post. Same here, I got “installation failed” in the DCUI. I used Notepad++ as well. This should has nothing to do with which text editor you use. Solved, it is the ” symbol. If you copy the configuration lines published here and paste it into the vmx file using notepad or notpad++, the ” is unreadable and cannot be interpreted by the setup process. In order to fix this, re type all the ” symbols and you should be good to go. You welcome. And well done for the instructions. I have installed the vcsa 6.5 on vmware workstation then I wanted to join it to domain but after reboot of vcenter many services won’t start including the vcenter service as well. It does not start neither manually. I then reinstalled completely again from scratch and I am getting the same issue. Before reboot i was able to log into web client. Hi there, thanks for your reply, no i haven’t tried it with Workstation 14 as i have not purchased a copy as they are not cheap and bought version 12 a year ago. I was wondering if it has stopped working with version 12 with some type of patch as since i upgraded to version 12.5.7 i cannot get this running anymore. Entered information in all the configuration sections – Network, SSO, root password, etc., but I skipped the “Upgrade” section. Configured the VCSA as “VSC with embedded PSC”, “tiny” sizing option. I’m able to get the Photon login prompt if I use ALT-F1/ALT-F2 (just like for the ESXi VM Host) but I cannot login using the root/password entered at the VM configuration. I have the same issue here. So when I hit F2 and tried to create a new passwordand entered a new password (“password”), I got an error saying “The password change operation failed”. I’ve successfully added hosts and created a cluster.